The same Texas lab that has reported acetaminophen in pet food, has reported finding cyanuric acid after receiving an unopened container of Hills Science Diet Light Adult canned dog formula. This is the first report we have received that was tested from an unopened container. The picture above shows 2 more cans from the same batch. 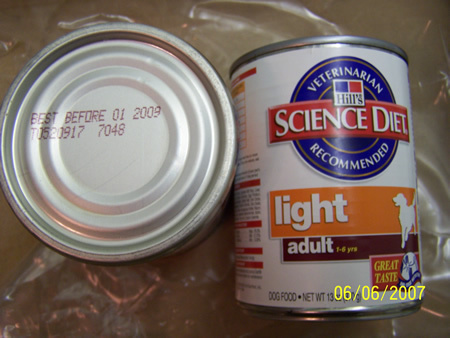 Science Diet Light Adult formula has not been recalled by the manufacturer. The lab report from Expertox obtained by Itchmo states that the tested product had a best before date of 01 2009 and had the lot number T0520917 7048. Cyanuric acid was reportedly found in concentrations of more than 400 ug/g — that’s micrograms/gram. Hill’s representatives declined to be interviewed over the phone and emailed questions were not returned in time for this deadline. An Itchmo reader tested the food based on veterinary tests on a dog. The reader’s email is after the jump. It has been edited to remove personal information. I received today the test results on the canned food from the case lot my 4-year old Shih Tzu was eating from when her blood work indicated that she was in kidney failure. We did IV for 4 days, antibiotics for one month, and now fluid therapy once a week. She is still alive, eating home cooked food, has a good appetite, but I don’t know where her kidney levels are at present. Her BUN was 160 before the IV therapy. The BUN came down following 4 days on IV, but was still high when I brought her home. The reader also said that another dog that did not eat the canned food had normal blood tests. This entry was posted on Tuesday, June 12th, 2007 at 7:09 am	and is filed under Dogs, Pet Food Recalls & Safety, National Dog, Cat & Pet Info, Products & Services for Cats & Dogs, News for Cats, Dogs & Owners, Veterinary/Medical. You can follow any responses to this entry through the RSS 2.0 feed. Both comments and pings are currently closed. Look at the first or second ingredient on any Hills brand pet food. It usually reads “Meat By-products”. This is the product of a rendering plant. What goes into rendering plants? Road Kill. Euthanized cats/dogs from animal shelters and vets. Euthanized livestock. Livestock that died before slaughter. All of the drugs and chemicals used to treat the animal or its carcass (incl. Formadehyde and euthanasia drugs). Used cooking oil and fats (PCBs anyone?). Mad cow disease and scrapie. Just name a few. No regulation or oversight. Earth Island Institute did a great expose back in the mid ’90s about the source and composition of such “by-products” ending up in pet food. Yes, that euthanized homeless cat or dog is being fed to your pet. I had a feeling last year the pet food industry were crooks. When my cat suddenly developed kidney disease. I thought well cat’s her age (15) get these problems. I looked into it more and I was horrified. I didn’t want to believe it. I admit I was in denial. Having been taught by mother and grandmother that this was good food the vet said so. When my cat started getting sick on a regular basis from Friskies gravy and cuts I had a red flag go up. I switched to a homemade diet. I also took her to the vet. While her kidney disease had progressed and was dangerously on the edge of almost being stage 3, with the homemade diet, medicine to bind with the phosphorus in the food, and IV fluids every other day my cat is looking and acting at least five years younger. My newly adopted kitten is also on a homemade diet as well. More protein, fat and calcium for the kitten, more protein with less phosporus and more calcium for my CRF baby. Both are doing very well. I hope that this brings the industry to its’ knees. I wouldn’t be sorry to see it go away and a push for balanced homemade meals from veterinary dietitians. The standard that the pet food industry found too expensive to go by and created their own AAFCO standard. It is always easy to get an A plus when you make yourself your own student. I meant Pet Food Institute found the standards too high and not cost effective and created its’ own group to rate the industries food. The effectiveness of melamine as a ruminant feed and the FDA are 2 unrelated things. You are right, the FDA is only empowered in matters of health and safety. I didn’t say the FDA had any interest in cost. I cannot find any specific references to melamine as a prohibited food substance for animals or humans on the FDA’s web site or via google. The American Veterinary Medical Association web site, www.avma.org does have references that melamine is not approved. b) Food ingredients and additives are allowed only if they are beneficial to the consumer or aid in preservation. These Chinese imports violates both of these requirements. c) banning as food would prevent accidental food cross contamination between ruminants and non-ruminants. In the year 1958, a major change was made to FDA law with respect to food safety for humans AND animals (since animals are part of our food chain). Given that melamine as a dietary nitrogen source for ruminants study was in 1978 (Newton, G. L.; Utley, P. R. 1978 http://olericulture.org/000/298/000298197.html http://en.wikipedia.org/wiki/Melamine), I am guessing it was unapproved sometime since 1978. I did read accounts of China having an excess of melamine, which would explain why it was found desirable as a gluten adulteration source. Melamine is a byproduct of ammonia and urea production and other chemical processes. It becomes scrap whenever it is thrown away. I think we all know what the word scrap means. In terms of chemical process, scrap melamine is only 1 of several undesired byproducts of ammonia snf urea manufacturing. Clearly, it would cost more to separate these individual products than they are worth, hence, they become scrap and sold for disposal purposes. This also can explain why come of the pet food contained cyanuric acid and other analogues of melamine, which together in a single diet can become toxic. An important point that everyone seems to not realize is that our food supply is safe from toxins, NOT BECAUSE OF EXTENSIVE TESTING OF INGREDIENTS, but because we have extensive regulations on what is permitted in our food. Everyone (in the U. S.) up and down the food production process knows this and abides by the regulations. The U.S. has had 101 years of food safety regulations. China, on the other hand, is where the U.S. was maybe 100 years ago, if even that. Except for Tembec, animal food producers did not knowingly use melamine as an ingredient. The Chinese even went out of their way to hide the fact that they had adulterated the gluten when they labeled it for export as textile products! They were hoping to avoid Chinese and US testing as a food ingredient. The FDA does not do health studies. That has to be done by food ingredient producers. The FDA accepts or rejects the studies as proof of safety. The FDA only checks for adulteration, and then probably only when there is a suspicion of adulteration. Melamine and its analogues do not accumulate but are excreted in the urine. When eaten, some things accumulate, some things are metabolized into something different, some things are excreted. The Chinese have been using melamine as animal (and human?) feed for years, the U.S. hasn’t. I think you misread something. Uniscope did test their ingredients from Tembec, that’s how we found out that Tembec was using small amounts of melamine as an adhesive for pellet feed manufacture, to bind the product together. I have written Science Diet the Hills Company as my Rat Terrier had been getting ill and having bloody bowels and vomiting and I received a email that said maybe she was having a allergic reaction to turkey or chicken in product. I changed her diet to Maxximum and no problems with the lamb and rice recipe for adult dogs. I also feed her a teaspoon of alpo gourmet a day and now she is doing fine. Then I find this web site about the recall and it really infuriates me alot to know about this. My rat terrier had eaten several cans of the recalled food already. I called the company as they were crumbling and dry and was told to return them to atwoods and exchange for a different sold by date. Oh I am mad now. Excuse me for saying so, but you seem to be a fountain of dis-information. Are you aware that fully half of the animal product that enter slaughter houses comes out not as human food, but animal by-product, destined to be animal feed. This will/would far outweigh road kill. And, PCBs in cooking oil? Mad cow disease is not transmittable between species, AND cattle parts are not allowed in cattle feed. You might want to brush up on current human food regulations at FDA web site instead of 10-15 year old information from Earth Island. It’s the month of May and Tembec delivers/distributes for/to Uniscope it’s product which by their own admission (according to FDA report) contains melamine.. It’s in their formulation and they make and sell to distributors. So because of the pet food recall and the melamine scandal Uniscope decides to test and they find melamine in their livestock feed ingredients.. (well yeah) Tembec didn’t just now start using melamine, especially at a time like this, they have been and they say so…. Time to check the others.. FDA says several comapanies have found it… The gist of this posting is that Dr. A said melamine was not allowed in any form in animal feed..
Tembec and Uniscope Voluntary Recall Feed Ingredients. FDA ASKS Feed Manufactures to AVOID ingredients containing Melamine. The COMPANIES have confirmed that TEMBAC ADDED MELAMINE as PART OF THE FORMULATION of the products to improve the binding properties of pelleted feed. Melamine is not approved as an additive for animal or fish/shrimp feed. TO CONTINUE with this FDA press release click the LINK…. I think that you are overlooking something, which is that the FDA is in a strong authority position. I would liken this to the situation of a school principal advising a student to do or not do something. The student knows that this is the highest authority on the school campus and that he/she had better listen and obey, even when the statements are not stridently demanding. People in a position of no authority at all are the ones that resort to making demands and commands of others. Then too, the levels of melamine in the final animal food product was determined to be very low, so low in fact that there was none detected in the fish meat, which had a much higher concentration in their food than the cattle did. And, the pigs and chickens that had been fed melamine contaminated feed were found to have a nearly non-existent level of melamine in their meat. Then, too, for all that we know, these terms were different in the press release than what was actually used in communication with the feed manufacturers and feed consumers. The degree of melamine contamination in the Swine and Poultry tissue is almost non-existent (less than 50 PPB). This is 20,000 times less than what was in the pet food. AND, most of the pork and chicken in the food supply were never even fed anything with melamine in it. Things need to be kept in perspective. Captn Carl, I was very interested to see that you say that some years ago Hills was found to be causing cancer in cats. My 3 cats got cancer having been fed Hills from kittenhood because my Vet wrongly told me it was the best food to feed them. I wonder if you could please give me any more details since I have alays felt that feeding them Hills gave them cancer. On Hills one also got cystits, kidney failure and one got struvite crystals which are caused by the carbohydrate in dry food and veterinary research existed even in 1991 which blamed dry food for causing this but my Vet when I asked if the dry food was the cause assured me it was not the cause and so my cat continued to be fed Hills and got worse and worse and had to be put to sleep. I think Vets and not just pet food companies should be sued because it is the Vets who have let the pet food companies away with this and who have told us to feed the food to our cats and dogs. I would like to see Vets being sued since they are very much to blame along with the pet food companies. The death of our ll year old miniature schnauzer in 2000 was caused by an auto-immune disease. Our 7 year old’s nails are now breaking off and he is now on medication. Both dogs have been on the dry Hill’s science diet, as recommended by our vets. After reading the blogs, I am suspicious of the dog food. What can I safely feed him? I REALLY wish there was something I could recommend — but, I can’t — and won’t. I’ve been cooking for my five since March. I will not even consider buying anything commercial for one year after the ~last~ reported complaint on these blogs. That is final for me. With the acetaminophen NON-RECALL bull-xxxx — It’s a rotten deal all the way around. There needs to be a class action suit filed against the FDA. On the positive side (from my view point) — if we DON’T BUY IT — they CAN’T SELL IT — thus, they GO BROKE — YIPPPPPEEEEE! Good luck in your quest, Norma! i have 2 dogs one 4 yrs old one 2 yrs old. i was feeding them the recommended dose of hills science diet adult formula for almost a yr. during this year my 4 yr old wouldnt eat the food so i had to feed him a different brand my 2 year old ate the hills diet daily and many health problems excelled like seizures and many as time went on digestive problems constant vomitting and loose frequent stools. i took him to vets which promotes the hills diet food and told me he had sensitive stomach along with not to worry about the siezures as many dogs get this and it isnt a reason to worry. i decided to take him off the hills diet and started him on benefull by purina and his siezures went away completely, normal less stool, and he keeps his food and water down now. hmmm it makes me wonder if hills is all that they claim to be because i dont have no problems with the 25 dollar purina dog food vs the 80 dollar science diet. buyers beware hills is not what they claim to be it would have killed my dog i believe if i didnt discontinue the use of their food. We just had a 5 year old healthy male indoor cat become diagnosed with stomach cancer. The MRI shows he has it all through his stomach and intestines. We are going to put him down soon. The only food he ever ate was Science Diet original formula. My 9 year old dog also died 4 years ago from leukemia cancer, and all she ever ate was Science Diet Lamb and Rice formula. We don’t smoke, have a healthy house and our pets don’t eat table food, they even drink filtered or bottled water. I can’t believe we would be so unlucky as to have 2 pets with cancer at young ages.